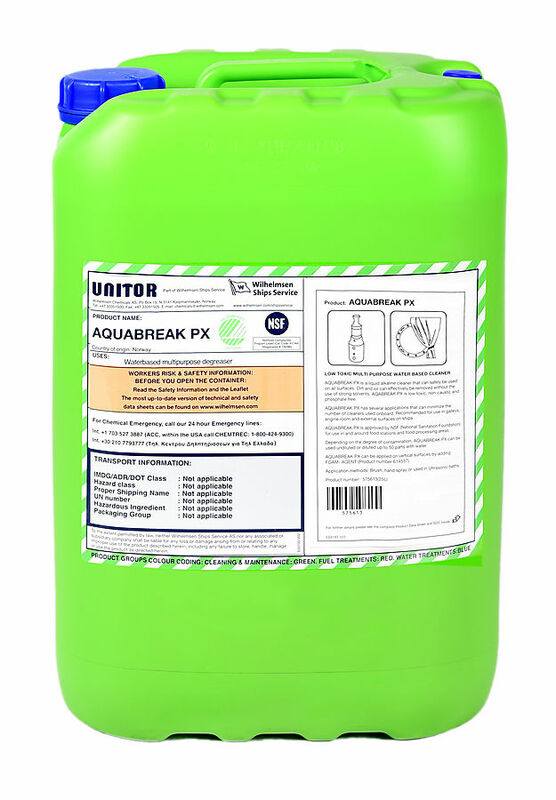 Unitor™ Aquabreak PX™ removes effectively dirt and oily matters without the use of solvents and caustic based cleaners. The surfactant formulation with complex binders has an excellent cleaning efficiency. Unitor™ Aquabreak PX™ is NSF approved so it can be used to clean food serving areas and food stations. Suitable for cleaning of soiled textiles as rugs, covers, mats, overalls etc. This composition meets the criteria for not being harmful to the marine environment according to MARPOL Annex V and may be discharged into the sea when used to clean cargo holds and external surfaces on ships. Unitor™ Aquabreak PX™ can be used for all types of cleaning and degreasing, and it can be applied by brush, hand spray or used in ultrasonic bath. It is recommended to test different concentrations on a small area to find the optimal effect on the contaminated surface. Depending on the amount and type soil to be removed, common dosage for light contamination is about 1-5%, for heavy contamination up to 20%. For safe handling and optimal dilution we recommend the use of the UNITOR™ MIXING STATION 4-14. Unitor™ Aquabreak PX™ can be applied on vertical surfaces by adding Unitor™ Foam Agent™ for increasing the resident time. Use a dose rate of 0.5-5 litres per ton wash water (0.05-0.5%). Use a dose rate of 0.5-7 litres per ton wash water (0.05-0.7%). Spot cleaning: Hand sprayed neat or diluted up to 1-5 parts with water. Leave solution for about 20-30 minutes before washing off, but make sure the surface remains wet. For problem deposits, please consult the Unitor™ Tank Cleaning Manual. Unitor™ Aquabreak PX™ can be used on the majority of tank coating materials, painted or lacquered surfaces, light metals, plastics and textiles.